Betsafe is going mad and are giving away free tournament tickets to all new poker players joining their ever so fast growing poker community; don’t miss out on this generous offer.You can get a free $5.50 tournament ticket now! Find here more details! Sign-up a new account with Betsafe.com and download the free poker client. Opt in for your free ticket bonus by entering bonus code FREETICKETENG in the “Available Bonus” section of the “My Poker Account” page. You have 30 days to opt-in for your free ticket. Your account will be credited with the free tournament ticket as soon as you have opted in and earned 1 Player Point. It is as easy as that. Sign-up today, and remember this is on top of their standard sign-up bonus offer. 1. 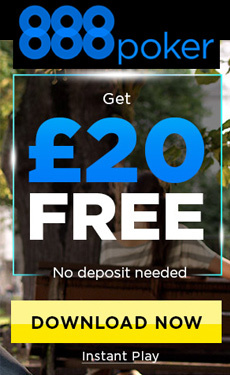 This offer is available to all Betsafe.com players which never played real money poker on Betsafe prior to the 1st of July 2012. 2. A player has to manually opt-in for the free ticket under “My Poker Account” in the “My Available Bonus” section of the website available when logged in using bonus code “FREETICKETENG” in capital letters, and the ticket will be released as soon as the player has earned 1 Player Point. Any points earned prior to opting in will not count towards the ticket release. 3. A player can only receive a ticket once and has top opt in for the free ticket within 30 days from playing their first real money raked hand. 4. As soon as the ticket is released the player has 60 days to use the ticket after which time it expires. It is the player’s own responsibility to manually register for a tournament in due time using the ticket. 5. The free ticket is valued to $5.50 and the ticket can be used for any online tournament were the buy-in exactly match the ticket value (buy-in + fee). 6. The tickets cannot be exchanged for cash under any circumstances. 7. The free ticket can only be received once per person, family, household, address, e-mail address, credit card number, IP addresses and environments where computers are shared (university, fraternity, school, public library, workplace, etc.). 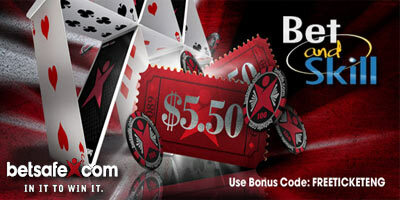 "Betsafe Poker: Free $5.50 Tournament Ticket for all new players"